One day there will be people living on Mars. And among the environmental conditions they will have to contend with will be the fact that they'll have to wait 687 days between each birthday. 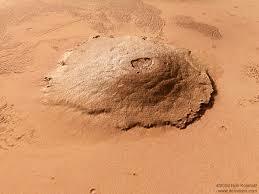 Mars hosts the largest known volcano, Olympus Mons, which is almost three times as tall as Mount Everest's height above sea level, and is about 600 km wide. This makes its average slope only 5° which means that the hardest part of an ascent of the mountain would be simply getting to base camp.